The RIPE Roadmap will impact climate mitigation, water quality, economic development in rural and urban communities, and rural broadband. CLIMATE IMPACT – Climate change can dramatically be mitigated by using the economically efficient price of pollution, currently estimated at $42/ton. This price is possible with the political will that will be enabled by the RIPE Roadmap coalition. 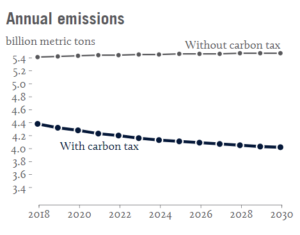 In contrast, the current political will is only allowing a price of carbon less than $5/ton of pollution in the New England cap-and-trade system. The difference in impact on pollution reductions from these two scenarios is depicted below. 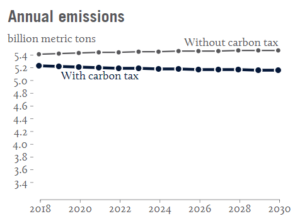 The left chart shows the current scenario at $5/ton that will reduce emissions by around 5% by 2030. In contrast, the right chart shows the 27% reduction in pollution in the same time, which is enabled by the $40/ton price that the RIPE Roadmap holds the promise of achieving through a bipartisan coalition. WATER IMPACT – The RIPE Roadmap will invest $47 billion to $188 billion in sustainable agriculture each year. This is significantly higher than current programs. Calculations are currently underway to quantify the water impacts. FARM REVENUE – Professional farmers can earn profit-oriented payments for their stewardship practices. If 25% to 40% of the revenue is made available to farmers for their stewardship practices, they can earn roughly $47 billion to $188 billion per year. For the average sized farmer, this can be in the range of $50-$230/acre or $30,000 to $118,000 each year. In contrast, current farm stewardship programs pay an average of $1/acre in a cost-share model, while the RIPE Roadmap pays a profit-oriented payment. The specific payment design will be determined by a coalition of farm trade associations, sustainable agriculture experts, and environmental organizations. 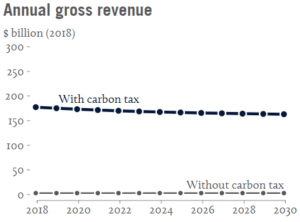 The amount of revenue available to farmers will be stable over time, even as pollution levels decrease, as depicted in the chart below. For more information, please contact Info@RipeRoadmap.Org.